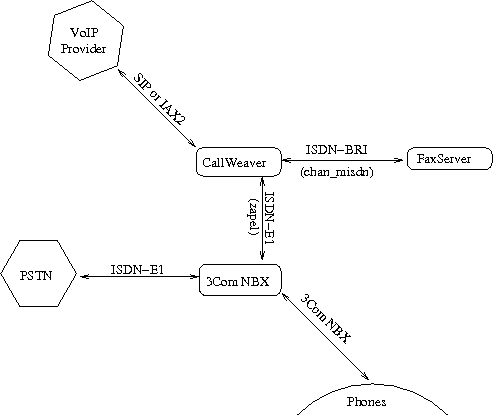 This is a description of how I used CallWeaver to fix some problems with a 3Com NBX system, like connecting it to a VoIP provider using SIP. The 3Com NBX has some limitations in its SIP-support which made it impossible for us to use the NBX to connect directly to a VoIP provider. We also needed to connect a Fax server with an ISDN-BRI card in it to the system. A BRI-card that can be used in N/T mode is not available for the NBX. Using the open source PBX CallWeaver as a proxy between the 3com NBX system and the rest of the world I was able to solve the problems above. The diagram below shows the setup I used. The NBX system was connected to a CallWeaver box using a spare ISDN-E1 CPE card for the NBX and a Digium E1 card on the CallWeaver side. A E1 crossover cable is used to connect the two. And due to the flexibility of CallWeaver and opensource software I could configure it to be the PRI-network end of the connection and let the NBX act as a CPE as that is the only thing it knows how to do. A BeroNet ISDN-BRI card with chan_misdn was used to connect to the fax server. CallWeaver and chan_misdn can easily be configured for NT mode allowing it to drive the fax server (TE) which was not possible to do directly from the NBX. The last thing to do was to configure the dialplan in the NBX to route some outgoing calls via the E1 to CallWeaver to be routed out via VOIP and also to route the Fax DIDs to CallWeaver that routes them via ISDN-BRI to the fax server. The NBX was configured to prepend a 0 to the numbers dialled out via VOIP and 1 to fax DIDs. This made it trivial to configure CallWeaver to correctly route those calls.